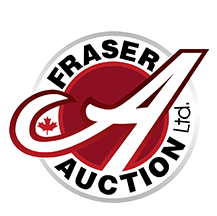 AMROY FARMS LTD RETIREMENT FARM SALE in Carberry, Manitoba by FRASER AUCTION SERVICE LTD.
1.3kms south on RD 81W to sale site on west side. TERMS: Terms offered on 2009 NH CX8070 SP Combine w/Swath Master pick-up, long auger w/extender, 20.8R42 duals, fine cut chopper, Intelli View Plus II Monitor, 969 Sep hrs showing, 1283 eng hrs showing, Complete NH inspection at 780 Sep Hrs, s/n301688017 (less than 200 hrs on concaves, feeder chain & rub bars) 2 owner unit, always shedded. Terms are: 25% down sale day by way of non-refundable deposit. Balance due on or before August 1, 2019 by certified cheque payable to AMROY FARMS LTD Units will stay in the possession of the AMROY FARMS LTD until paid in full. Purchaser must insure unit at time of sale.